USS IOWA is now a museum in Los Angeles and is available for filming. As such, this Naval ship can now be sourced for movie, commercial and series locations in Los Angeles area. The legendary naval ship is the lead vessel from the last class of battleships that includes the USS Iowa, USS New Jersey, USS Missouri, and USS Wisconsin. The Battleship IOWA has served over 70 years and is a museum today in the Los Angeles area. On the Battleship USS Iowa, there are many decks and ship’s compartments that represent from World War II to a modern-day configuration. The ship has played numerous roles for film, television and commercial including submarines, destroyers, cruisers, and aircraft carriers. Ship includes mess decks, Naval gunnery, engineering spaces, hospital, sleeping areas, combat engagement center, senior officers cabins, and lots of great backdrops. Call 877-446-9261 ext. 3 or email filming@labattleship.com to schedule a location visit. Known as “The Battleship of Presidents”, the IOWA has hosted three United States Presidents over 70 years. Located in San Pedro, the Battleship IOWA Museum is less than 30 miles from most major studios. 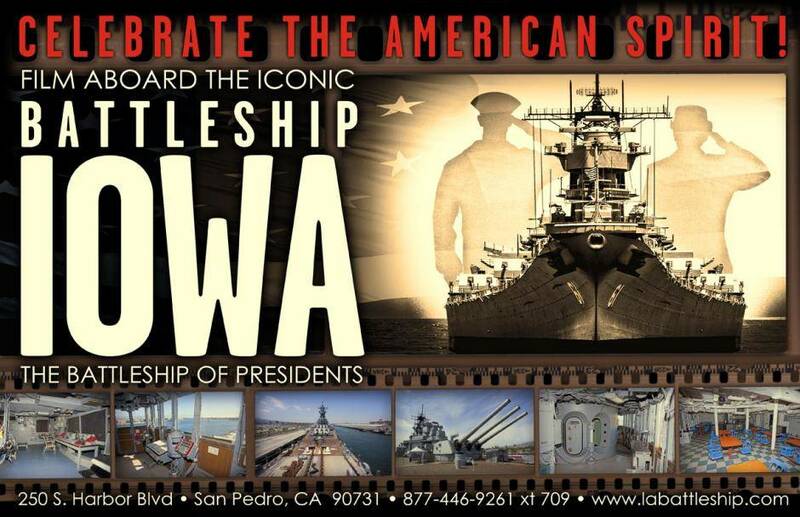 When a Naval ship is needed, the Battleship IOWA Museum in Los Angeles answers the call! Most importantly, the ship is located less than 30 miles from Hollywood, being called upon for roles requiring warships. For more information and rates, contact our on-board film department.